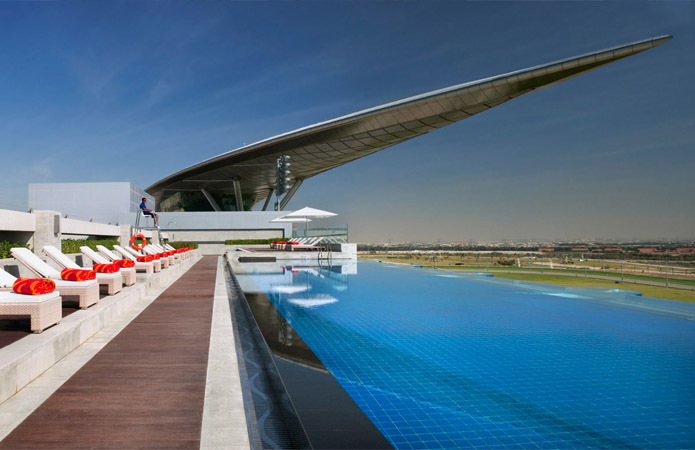 The Meydan Hotel, Dubai wanted to revamp the decking area around its panoramic racetrack pool as part of the wider Dubai Meydan City development construction project which comprises malls, a marina and a business centre. The Meydan Hotel itself is a 5* establishment next to the racecourse and has all the amenities and facilities you would expect of such a prestigious development. However the hotel felt that there were aspects of the hotel that needed improving with the panoramic pool area highlighted as a focal point for significant improvement. When the hotel was built a traditional hardwood timber decking was laid around the poolside area, however within just a couple of years the deck was showing signs of serious aging with cracks, splits and patches of rotting having appeared along the deck. The traditional timber deck could not handle the abrupt changes in temperature in Dubai and the constant impact of water on the deck impaired the structural integrity of the timber. With the weather patterns of Dubai being those of harsh contrasts a product was needed that would give the poolside a vibrant and modern look while being able to withstand the conditions. We were among the products who took part in the tender process for the replacement poolside area as a viable alternative to traditional timber. Our redwood and ebony composite decking boards were chosen as the perfect accompaniment to the pool area. Not only is our composite wood able to thrive in conditions which are unsuitable for traditional timber the hotel management was pleased that it could retain the look of timber as was originally intended. Our decking is anti-slip and so it is the ideal product to go by a poolside. The textured groove feels great underfoot and composite decking is suitable for any weather conditions and can easily cope with the hot days and cold nights of the UAE. The rooftop pool overlooks the Dubai Racing Club racetrack so hotel residents can enjoy all the fun of race day from the comfort of the hotel pool. The redwood composite decking was used to surround the poolside itself while the ebony composite decking gave a stylish finish to the café area. The poolside area was able to achieve the slick, modern look that was desired in the initial plans. We shipped all of the decking, fixtures and finishing from the UK and went to Dubai to observe the installation. Because composite decking employs a clip system to fit the decking the installation was a quick process and so did not unduly impact upon the hotel residents. Both we and the Meydan proprietors are extremely pleased with the outcome of the poolside area and look forward to a continued partnership in the future. The build was completed alongside our partners in the Middle East, Timber Tech LLC. Timber Te ch are pioneers in the region for their engineering design and installation of outdoor timber and WPC projects which range from decking to pergolas and include fencing and gazebos. Timber Tech’s workforce is highly skilled and professional and has successfully managed many high-profile projects througout the region. This include the Dubai Mall, Victory Heights and the Burj Khalifa Lake Promenade in Dubai. We continue to work closely with Timber Tech LLC on projects in the region and look forward to an ongoing and long lasting working relationship.